Brad from Nerd Knuckle Effects made a batch of limited edition, custom color pedals just for Stompbox Sonic. The purple/gold sparkle finish was inspired by our beloved J Mascis Jazzzmaster. 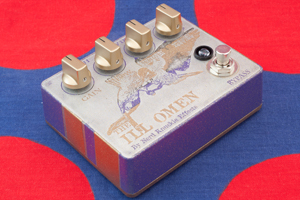 The Ill Omen is a low gain overdrive. Despite the sinister implications of its name there is nothing crazy or overtly evil happening here. Just plenty of nice warm oomph to your signal.